Inditex, the leading and largest fashion brand of the world, is the parent company of Zara and based in Spain. Zara is now a well known fast fashion brand. Apart from Zara, the other brands that Inditex owns are Pull & Bear, Massimo Dutti, Bershka, Stradivarius, Oysho, Zara Home and Uterqüe. Inditex is known for excellent supply chain management, high level flexibility as well as innovation in fashion. It employs more than 171,000 people and is operational across 96 countries through its large network of physical and online stores. Apart from its 46 online markets, Inditex group has 7,475 retail stores worldwide. Inditex has several great things to boast about apart from its highly integrated and sustainable business model. During the recent years, Inditex has focused upon growth of its retail channel and introduction of technology in its retail stores for higher customer convenience. It is also optimising logistics to bring more efficiency across its retail network. However, the success of Inditex was not possible without focusing on human resources. In this area too Inditex’s performance is worth highlighting. When it comes to gender diversity, the brand’s success is remarkable. The business is continuously investing in optimisation of its supply chain and sales channel to make its business model more efficient and achieve better growth. In 2017, Zara rolled out its online platform in India, Malaysia, Singapore, Thailand and Vietnam. Success of Inditex has been made possible through creative passion. More than 700 designers are making fast fashion possible for Inditex. Read more about the leading fashion brand that has rolled out great options exclusively for the middle class people in this marketing mix covering the 7P’s. ZARA:- ZARA is for the fashion lovers who like to dress responsibly. It is for those who want their fashion sober and modern. ZARA still makes a distinguishable style statement. 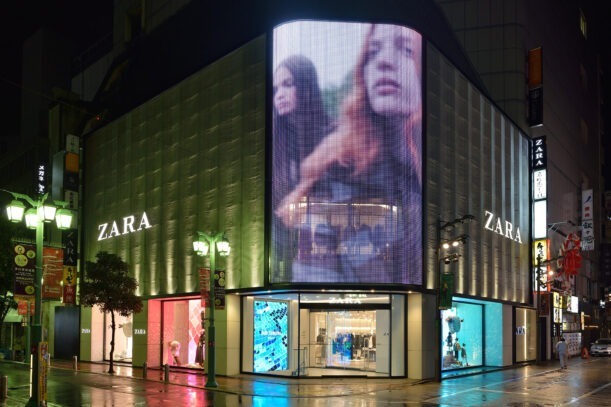 ZARA defines its focus in four core values – beauty, clarity, functionality and sustainability. Pull&Bear:- Pull & Bear is for the young and the dynamic. It is distinguishable for its fun styling, fusing international and club influences with a playful attitude. It offers two lines forth men and women, the first which is targeted at the teenagers and the second at the adults. Massimo Dutti:– Massimo Dutti targets the urbane, independent, cosmopolitan men and women. This band joined Inditex in 1991 and released its first line for women in 1995. “From the high sophistication of personal tailoring line to the comfortable fit and timeless style of more casual and relaxed pieces, Massimo Dutti epitomises a natural elegance”. Bershka:- Bershka line of fashion is targeted the next-gen that is immersed in music, technology and social networking and catches the latest trends in fashion. Even the Berserk stores are designed along the same theme to engage the adventurous nextgeners. Stradivarius:- Capturing the essence youthful creativity, Stradivarius is for the youth seeking the latest and most innovative in fashion. It offers lines to dress the youth comfortably regardless of occasion. Oysho: Osho is targeted at the female customers and fuses the modern with the elegant and the timeless. It was founded in 2001 and specialises in lingerie, gymwear, beachwear and homewear. Its designs merge fashion and grace with comfort capability. Zara Home: ZARA home is Inditex’s special line of home furnishing products. ZARA home has brought home furnishing into the fast lane and updates its product range twice a week. It has brought latest ideas and designs for beautiful interiors. Its textile ranges, which include bedding, bed linen, tableware and bath linen which it complements with dishware, cutlery, glassware and home decorations, as well as clothing and accessories to maximise the comfort and intimacy of hime life. Uterqüe: Uterque was released in 2008 and specialises in high quality accessories, leatherwear and clothing. Targeted at women it offers accessories that fit well with modern dressing and also confirm to the environmental standards set by Inditex. In this way, Inditex has brought a long range of fashion products that cater to the needs of various customer groups. Apart from clothing, it has brought home furnishing products and accessories too. Apart from aesthetic beauty, its products are exceptional in terms of design and quality as well. Since its foundation in 1985, Inditex has seen a lot of expansion and growth. As per its 2017 Annual report, the brand is now selling across 96 markets. In 2017, it opened 524 new stores in 58 markets. As of 2017, it had 7,475 total stores. Based on geographical regions, its market is divided into three segments which include the Americas, Asia & ROW as well as Europe. The number of stores in Americas was 805, in Europe, 5008 and in Asia & ROW 1,662. Zara, the flagship brand of Inditex had 2,251 stores in 96 markets and 46 online markets in 2017. These numbers have further increased in 2018 and Zara is now available across 48 online markets (as of Nov, 2018). In 2017, the Inditex group focused its growth efforts to increase its online presence in Asia. It launched its e-commerce platforms in Asia in India, Malaysia, Indonesia, Singapore, Thailand & Vietnam. In China and Japan too, the group had some of the best openings. Inditex brands opened their stores in 10 new Asian markets in 2017. The company is using an optimized mix of online and physical stores to expand its global presence and to increase its sales. Inditex has 12 supplier clusters accounting for around 95% of entire production of the brand. They are located in Spain, Portugal, Morocco, Turkey, India, Pakistan, Bangladesh, Vietnam, Cambodia, China, Brazil and Argentina. Inditex products are manufactured in total 7,210 factories and through the help of 1824 suppliers. The pricing strategy of Inditex has played an important role in the growth and expansion of its business. It is one of the most important pillars of its business strategy. However, Inditex has tried to touch different customer segments with different tastes through its various brands. Not all of these brands follow the same strategy whether in terms of pricing or product design. Some of them are targeted at the average middle class consumer while others are a bit pricy and cater to the needs of the higher end consumer. Zara, Bershka and Pull & Bear are affordably priced brands that are targeting the middle class shoppers who want their fashion stylish but affordable. On the other hand, Massimo Dutti and Uterque are targeted at the higher end customers who are willing to spend more on their fashion. With regards to marketing and promotions, Inditex has never used brand promotions aggressively to pull customers. It is known to maintain a minimal ad spending. It still manages to promote its brands well but that too without spending a fortune on marketing campaigns and advertisements. However, it has taken care of certain things that are important for any great brand which wants to become its customers’ favourite and retain them for longer. It has managed a large team of expert fashion whose number exceeds 700. These people know their customers and their taste very well and bring amazing designs that appeal to their customers. This is how the brand of Zara has grown. Apart from quality, its prices and designs have also created the necessary buzz in media. Inditex has grown very fast in a very small period of time. It is now the largest fashion brand but has pulled this miracle without investing in marketing. It used other channels for marketing. It invested instead in good store designs and great customer service. Inditex focused on providing its customers and immersive experience that would engage them and grow their interest in the brand. So, instead of trying to push sales, it focused on pulling customer by turning shopping into a distinct and comfortable experience. The few channels that it used for marketing were its own website, its e-commerce platforms and the social media. The brand used social media and other free online channels to create excitement and for running promotional campaigns. By creating a distinct customer experience inside its stores, it was able to drive user loyalty high and create a better brand image. A lot of the credit also goes to its brand image, its store design and the great level of customer service. If you cannot engage your customers well, it just remains a give and take relationship. Zara instead built a string connection with its customers and the right atmosphere. The rest channels that it used for promotions were sufficient and did not need any penny in investment. So, in the world of marketing, ZARA achieved no mean fit just by focusing on its customers rather than depending on great advertising. However, to improve the customer experience further, it has started investing in IT, AI and virtual reality to ensure that the customers have an elegant and immersive experience. People are the strength of Inditex. The company has over 171,000 employees and the brand has focused on their engagement as well as learning and growth. Inditex is committed to fair and decent treatment of their employees and have respect for labour and human rights. It has adopted responsible practices with regard to ethics and code of conduct. Apart from that the company also focuses heavily on team motivation and trains employees to collaborate. The brand cares for occupational health and safety and trains its employees to be careful regarding people’s health and safety at the workplace. It ensures inclusive and equitable quality education for all its employees. Other important focuses at Inditex are gender equality and empowerment of women. At the end of fiscal year 2017, the brand had people from 97 different nationalities and who spoke 54 different languages. 75% of the Inditex employees are women and just 25% men. Female leadership is one of the key pillars of its business model and an important pillar of its success. The composition of its workforce is also excellent in terms of generational diversity. For managing its enormous human capital well, the brand has built a culture that focuses upon teamwork, humility, diversity, sustainability and being open to new ideas. It has a separate website called Inditex careers that it uses to attract and retain best talent. Internally too it is focusing on performance manage to prepare the fashion leaders of tomorrow. In 2017, Inditex provided more than 2.1 million hours of training to its employees and more than 93,000 people from more than 40 countries attended these training programs. There are several kinds of programs including those meant for training employees in languages, business management as well as fashion and textiles. Total personnel costs of the brand reached 3.96 million Euros in 2017, rising from 3.64 million Euros in 2016. The average salary per full time equivalent employee per year was 22,627 Euros. Inditex has adopted an integrated business model that has brought higher efficiency. Its fast fashion model has been appreciated worldwide for its level of synchronization and efficiency. There are more than 1800 suppliers supplying raw materials to the Inditex factories. Apart from that there are more than 700 designers that bring their creative imagination alive at Inditex to serve customers all around the world. It has managed a sustainable supply chain that caters to the needs of a fast changing world of fashion. There are three important features which have helped the business manage a well integrated and innovative supply chain. They include information management using a common IT tool; monitoring through our audits, and continuous improvement and sustainability through training. There are special purchasing teams that manage purchasing and make decisions based on the sustainability criteria set out by Inditex. The company has also used Information technology enabled tools to manage supply chain transparency and efficiency. Timely availability of quality raw materials ensures that quality fashion is made available in the stores at regular intervals. The business model adopted by Inditex is best suited to cater to the needs of a fast evolving fashion world. It is also expanding its physical and online presence all over the world in order to make its products available in all corners of the world. Inditex has built a strong business empire that spans 96 countries. Moreover, the brand has maintained a strong presence in key markets through a network of online and physical stores. Its strategy has been to open physical stores in key locations to attract maximum footfalls. These stores have excellent internal design and provide its customers an immersive experience that is accentuated with the help of AI and virtual reality. “Bershka stores globally showcase avant-garde styles in ways as per its philosophy of immersing its customers in the youth aesthetics of a new century. It launched ‘Stage’ concept in 2016, to provide an immersive experience, with music, screens, projections, modern graphics, vibrant colours, contemporary furniture, state-of-the-art lighting and other things so as to make the Bershka experience a distinct experience. The same applies to the other Inditex brands as well. As in case of Uterqüe whose clean and contemporary spaces, mid-century modernist aesthetic, and latest-generation lighting to bring out the quality of its products, create a unique atmosphere inside its stores. Oysho mixes Mediterranean aesthetics with contemporary technology, to create warm and open spaces for its visitors. Inside the Zara stores, the focus is on providing exceptional customer service and an experience very different from ordinary. Inditex truly makes a remarkable statement with the help of its store designs and the welcoming atmosphere inside them.